In a move that has infuriated neighbouring China, the upper house of the Japan’s parliament (the Diet) has approved legislation giving more power to the armed forces. This legislation will allow Japanese troops to fight overseas – something has been banned by the Japanese constitution for nearly 70 years, since the dissolution of the Japanese Empire at the end of World War II. 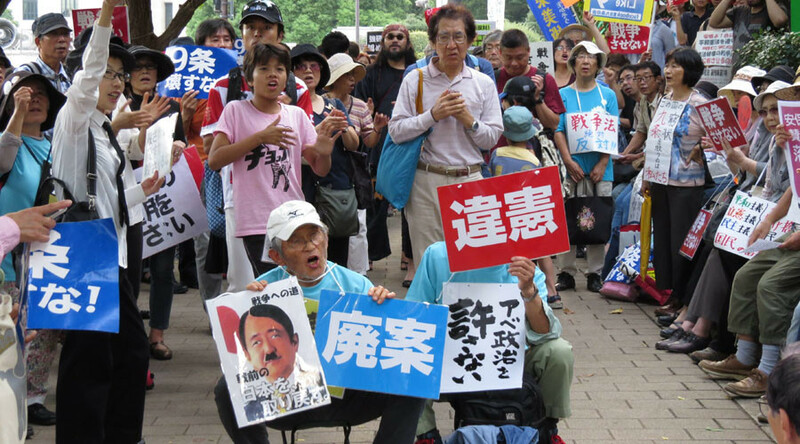 The Lower House passed 11 security-related bills on July 16 – an act, which was followed by a wave of protests. The Upper House’s final session was called late Friday night and they finished early Saturday morning with the enactment of 2 of the controversial security bills. 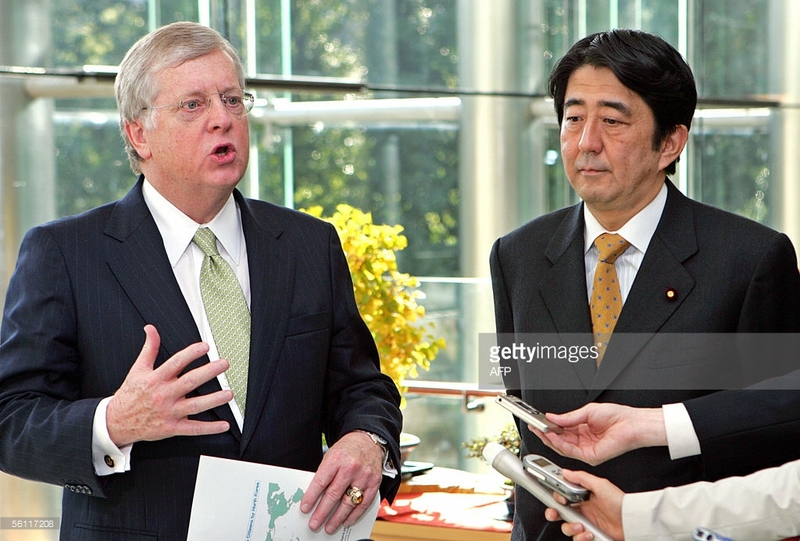 Officially a pacifistic nation for the last 7 decades, this law brings up for many modern and older Japanese citizens reminders of their military aggression in the past. Ground Self-Defense Forces personnel were deployed in Samawah, Iraq, from 2003 to 2006 as part of Japan’s humanitarian and reconstruction assistance. 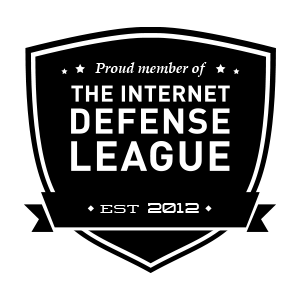 In recent years, though, the line between defense and offense has blurred. 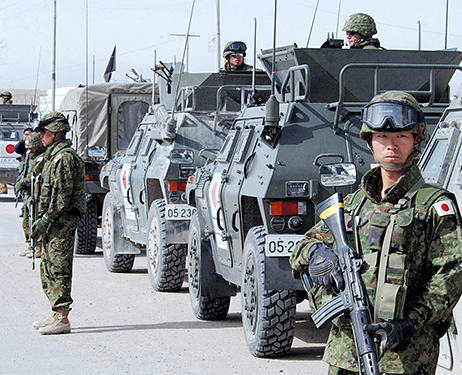 In 2004, Japan sent its Ground Self-Defense Forces to Iraq — the first deployment of Japanese soldiers in an active combat zone in over 60 years. With North Korea test-launching ballistic missiles into the Sea of Japan and China’s economic and military expansion, Japan has started reconsidering its regional strategy. Ceremonial deck assembly aboard the JDS Hyūga at the 2010 Ise Bay “Marine Festa” [festival] in Japan. In 2008, photographs of Japan’s newly commissioned Hyūga-class “helicopter destroyer” raised eyebrows around the world – as it looked exactly like an aircraft carrier, though smaller. Many Americans and Japanese expressed disapproval, still highly sensitive of the carrier-led Japanese surprise attack on Pearl Harbor in December 1941, which led to the American entrance into World War II. 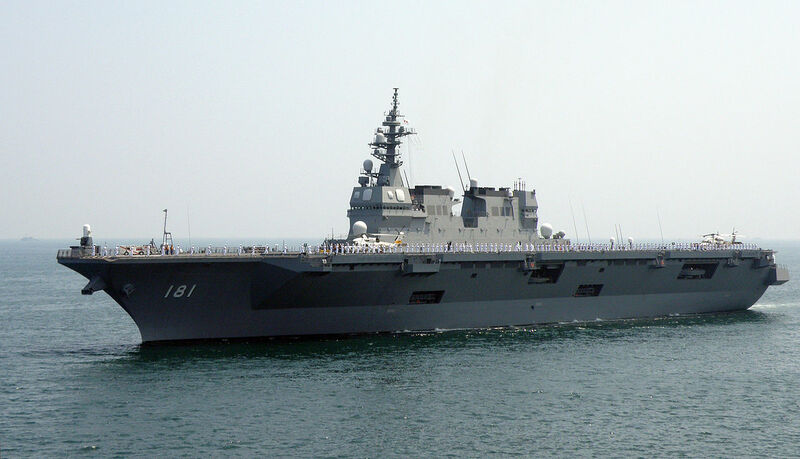 Upon completion the 13-000 ton Hyūga and Ise were the largest ships built for the Japanese navy since the Second World War, and have 4 helicopter landing pads each. Hyūga was described in a PBS documentary as the “first Japanese aircraft carrier built since WWII.” To add further controversy, both of these carriers were named after the Ise-class battleship Hyugaof the Imperial Japanese Navy, launched in 1917 and converted into an aircraft carrier in 1943. But the Japanese navy’s building program has not ended there. 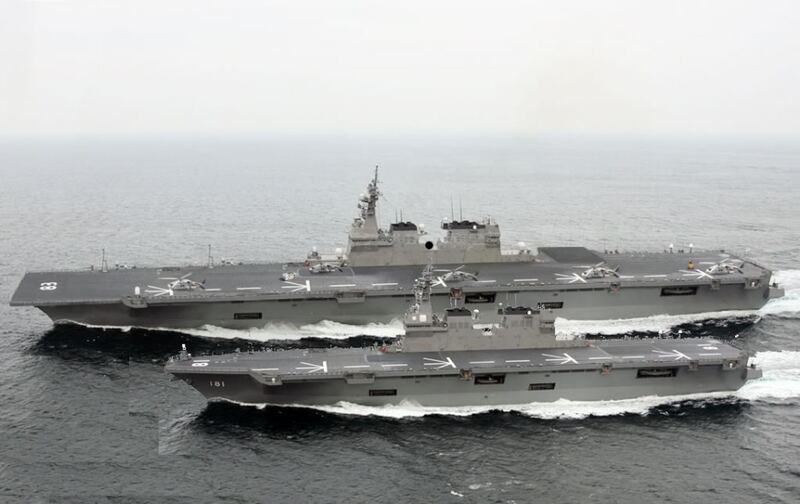 The first of the Izumo class helicopter carriers, the much-larger 24,000 ton, 5 helicopter-pad Izumo, was launched in August 2013 and came into service in the Japanese Maritime Self Defense Force (JMSDF) in March 2015. 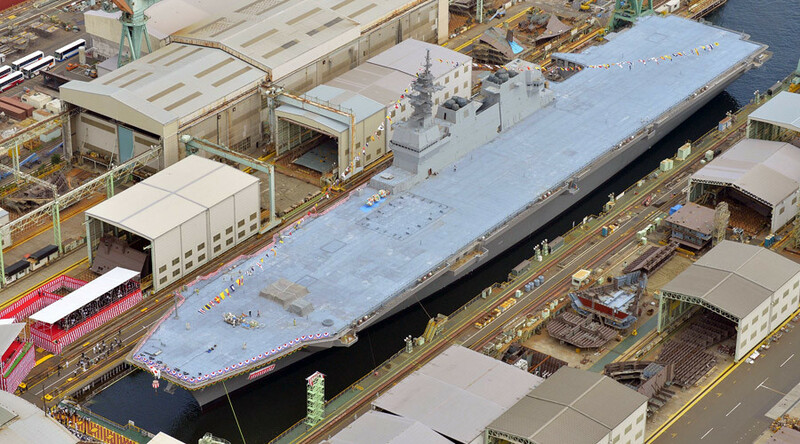 And just last month, Japan announced the launch of the second and file carrier of this class, the Kaga, launched at the Japan Marine United shipyard in Yokohama on Thursday, August 27, to be commissioned in March 2017, Sputnik reports. Students of history will once again be surprised to hear the name of another World War II Japanese ship – the original Kaga infamously took part in the bombardments of the China’s eastern coast including the cities of Shanghai and Nanjing in 1937. Later, it also was a part of the naval group that attacked Pearl Harbor in December 1941. Eventually, the ship was sunk by the US navy in the Battle of Midway in June 1942. Prime Minister Shinzo Abe, whose ruling block extended the session to Sept. 27 and voted down all the motions from the opposition to ensure that the legislation was passed, says that Japan needs to be up to the challenge in today’s world, taking into account a rising threat from China.Of course I don’t remember Pearl Harbor or any of the Pacific Theater events of the Second World War, having been born in 1967. However, I can understand the nervous tension that this military build up has caused – I had similar chills when I saw these “helicopter destroyers”.Japanese officials said that the primary roles of the four modern helicopter carriers are peaceful, such as humanitarian aid and disaster relief operations. However, they have also mentioned that the ships could be used in anti-submarine warfare. The ships “heighten our ability to deal with Chinese submarines that have become more difficult to detect,” a JMSDF officer told Japan’s Asahi Shimbun newspaper in March 2015. Kaga will carry seven Mitsubishi-built SH-60k anti-submarine patrol helicopters able to detect sophisticated Chinese submarines as well as seven Agusta Westland MCM-101 mine countermeasure helicopters, according to the US Naval Institute’s News. The ships also have potential to launch American-built assault transport MV-22 as well as the Lockheed Martin F-35 Lighting II Joint Strike Fighter with their short takeoff and vertical landing capabilities. BBC has reported that Japan plans to buy 42 of the planes, 36 of which they would like to see made in Japan. 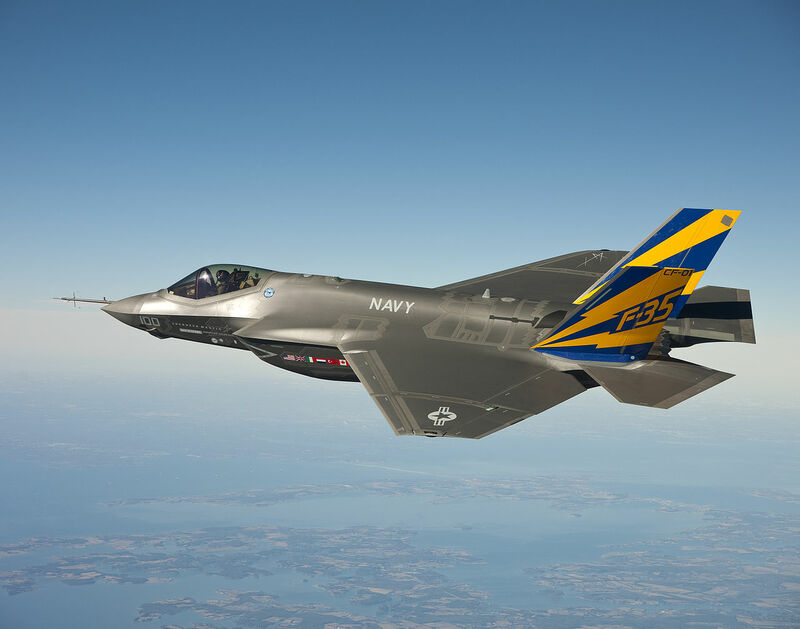 Delivery of the first is expected in 2016. I just hope, as they continue to expand their military like crazy, that this time they are actually on our side.